When Maynard James Keenan isn't painting himself blue and exercising his inner demons, apparently he has quite the regular day job as, well, a grocer. 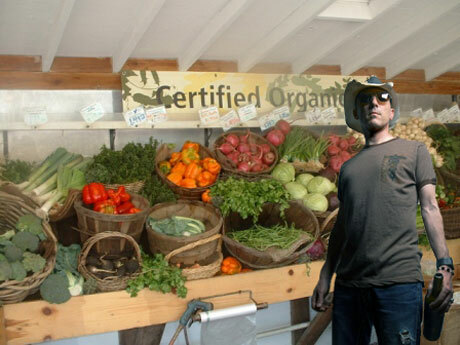 Yes, it's true: the fornt-man behind such twisted rock acts as Tool, A Perfect Circle and Puscifer has been staking his claim in the world of organic produce, as well as wine, and he's now expanding his operations. In an interview with Spinner, Keenan said he plans to revamp his new organic produce market in Cornville, AZ, with a commercial kitchen and even a tasting room for his ever-expanding winemaking business. "I've been working with a few chefs around the Southwest, learning how to make spaghettis and pastas and gnocchis and various soup stocks," Keenan said. "We're going to be packaging our own stuff right there and serving it fresh with the tastings." If you at all find it strange that this supposedly warped soul is pursuing such an average vocation, he says this all came before the rock'n'roll lifestyle and is really just part of the Keenan package. "In reality, I was doing many of these things prior to Tool," he said. "That's the one that got really popular, so it seems like the only thing I've ever done because it's the only thing you've heard of me doing. But they all get as much of my energy and focus as each other." Hmmm... perhaps Keenan and Dave Mustaine should join forces.